All transactions are safe and secure with a reliable history in online purchasing behind each of our associates. Buy the District 5 Power shirt to own Hunger Games clothing and merchandise. Inhabitants of District 5 work in the power industry, as indicated by the design on this District 5 shirt. The most well-known tribute from District 5 is a female by the name of Foxface, a nickname that Katniss gave her due to her red hair and thin face, not to mention that she is rather sly. Foxface, who proved to be a worthy competitor in the 74th Hunger Games, survived until the last leg of the tournament. An unnamed boy tribute hailed from District 5 as well, but he was among the first to die. 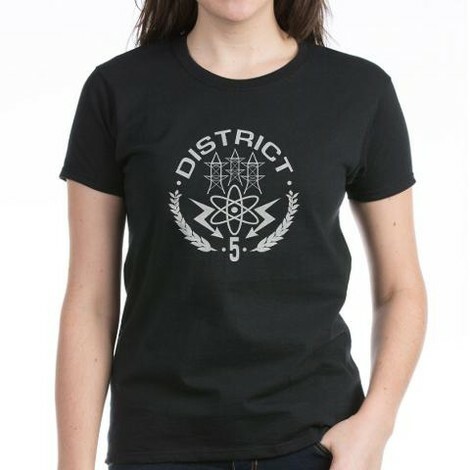 In addition to the District 5 Power tee above, browse the Hunger Games Clothing Gallery for more apparel like men's and women's clothes, kids shirts or hoodies.